‘Invited the members of cabinet and explained why I had resigned. It was quite obvious that the politicians are hell bent on disrupting the country, and besides, economic life was coming to a halt. Workers and even government officials had said goodbye to discipline. In any case, I could not sit on the dissolution of Pakistan by lawful or unlawful means.’ This is Mohammed Ayub Khan, the second president of Pakistan, explaining to his diary why he has decided to step down from office. Ayub Khan, born 110 years ago today, kept a detailed diary in the latter years of his life with the full intention of it being published, but not till long after his death. Since publication, in 2007, Ayub Khan’s diaries have been praised for providing a unique insight into the country’s politics at the time, but they have also been condemned for the way he denigrated his contemporaries. Ayub Khan was born on 14 May 1907 in Rehana, a village in what was known as the North-West Frontier Province (now Khyber-Pakhtunkhwa, province of Pakistan), the first child of the second wife of Mir Dad, a soldier in the British Indian Army. He rode four miles to his first school on a mule, then lived with his grandmother while attending a school in Haripur. He studied at Aligarh Muslim University before being accepted into the Royal Military Academy at Sandhurst, though he did not complete his degree there. As well as his regional Hindko dialect, he was fluent in fluent in Urdu, English and Pashto. He followed his father into the British Indian Army, rising to the rank of major by 1941. During the Second World War, Ayub Khan was second-in-command of a regiment in Burma (Myanmar) and in charge of a battalion in India, being promoted to colonel. After the establishment of Pakistan in 1947, he rose quickly in the new country’s army from major general to commander in chief, serving briefly in 1954-1955 as minister of defence. 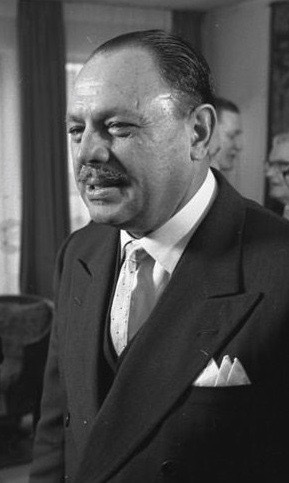 After several years of political chaos, Ayub Khan emerged as the country’s leader in the late 1950s, being elected president in 1960 (he also held the post of minister of defence). He helped restore the economy through agrarian reforms and by promoting industry and encouraging foreign investment. He also introduced a system of local government, and moved the country’s capital from Karachi to the planned city of Islamabad. His period in office was characterised by worsening relations with India. In response to China’s invasion of northern India in the early 1960s, the US had begun to re-arm India; in response Ayub Khan moved to establish closer ties with China. And, in 1965, Pakistan went to war briefly with India over a boundary dispute in Kashmir. Although that same year, Ayub Khan was re-elected president, the simmering Kashmir dispute and growing turmoil at home, including riots, led him to resign office in 1969. He died a few years later, in 1974. Further information can be found online at Wikipedia, Encyclopaedia Britannica, or the Pakistani magazine Forum. For several years, towards the end of his life, Ayub Khan kept a diary. 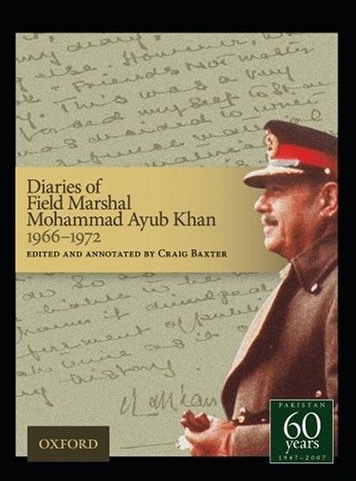 Edited and annotated by Craig Baxter, this was published by Oxford University Press in 2007 as Diaries of Field Marshall Mohammed Ayub Khan 1966-1972. In an ‘Author’s Note’, he explains his reasons for keeping the diary, and why he mandated it not be published for ‘a long time’. Here are several extracts from Ayub Khan’s diaries. ‘The deputy foreign minister of the Soviet Union, Nikolai Pavlovich Firyubin, came to see me in Swat. His objective was to gain support on the stand they are taking on different world problems in the current General Assembly. Problems like disarmament, non-proliferation of nuclear weapons, Vietnam, decolonisation, future of Southwest Africa, etc. are involved. Our views are not dissimilar. I brought up the question of more economic aid, supply of arms and the danger of arming India to such an extent. He took note of these things and promised to convey my views to his government. The general impression one gets is that the Soviets are happy about the manner in which our relations arc developing and so are we. It is in our interest that our relations with the Soviets should gain depth. We can then develop greater leverage with the USA and India. ‘Went to the Kalam Valley at the head of Swat Valley for a day. In fact, there are two main valleys from the village of Kalam with beautiful rivers flowing through them. We motored up these valleys part of the way. The scenery was fantastic. The roads have made all the difference to the life of the people. They can get their products out and get their requirements in so cheaply. All villages are connected by a bus service. They hardly had any winter crop in the past. Now the agriculture department has developed a strain of wheat for them which does well on those heights. All this has remobilised the life of the people. There are schools, dispensaries and rest houses in all places of note. On the way to Kalam, we found many signs of progress and prosperity. The Wali has done a lot for his people. There is a great influx of tourists, especially in the summer. Small hotels and rest houses are, therefore, springing up everywhere. The trouble with the Wali is that he is not interested in agriculture and horticulture and is not prepared to take advice or learn. If he did, a lot of development could take place increasing the income of the people and the state manifold. ‘Ayub Awan and the governor of West Pakistan and the defence minister came to see me to transact business. Bhutto’s acrobatics on politics were brought up by every one of them. Mr Farooqui and the architect showed me the plan and model of president’s house in Islamabad. It looked very attractive. I told them that the cost should be kept as low as possible. Gave a reception to the dignitaries of the Colombo Plan. The conference was held in Karachi. About seventy guests attended. ‘Went to Nawabshah for a day shoot in the Pai forest. The bag was 135 partridges. I shot 79. It was a poor shoot. Something has gone wrong. There are not so many birds there now. ‘Mr Pirzada, the foreign minister, saw me on return from Geneva where he had gone to meet our team who are fighting the Rann of Kutch case with India before the tribunal. It is understood that the Indians, finding their case weak, are now trying to gain time and influence the tribunal by other means. They have suggested to the tribunal to visit India for sightseeing and inspection of the Rann. Mr Pirzada was instructed to tell our representative on the tribunal to warn the president of the danger of this. If they listen to the Indians, they will only be exposing themselves to the charge of being bought. Laid the foundation stone of Tibbi Institute being sponsored by Hakim Saeed. The doctors are very perturbed. They think that quacks are being given unnecessary encouragement. I warned in my address that unless Tibbis modernize their science and allow their research to be subjected to critical analysis, they would not be able to bluff their way through. ‘Mr Suleri has written a penetrating article on the root causes of political maladies in Pakistan. I entirely agree with his diagnoses, but I don’t agree that the remedy suggested will draw much attention and bind people together. Islam, as propounded by the theologians, has ceased to be a living philosophy. It does not offer socio-economic satisfaction in an institutionalised form. Besides, the pull of parochialism and Bengali nationalism is so great that any remedy for constitution that does not take these actors into consideration is bound to fail. I can claim this much credit that I succeeded in keeping the country together for the last ten years and made them do constructive thinking. That is no mean achievement. And if they had gone on like this for another ten years or so the country would have reached the takeoff stage and the people would have entered the scientific and technological spirit of the twentieth century. However, they decided to do otherwise, reject my system and run away from the path of progress and self-control. The result is that even the existence of the country is now in jeopardy. I hope and pray that God saves them from extracting due price for their folly. Started for Swat where I intend staying with Naseem and Aurangzeb [daughter and son-in-law] some time before my house in Islamabad is ready for occupation. I hope to be able to rest, do some reading and have the opportunity of playing with my grandchildren. In any case Swat is a heavenly place to stay in and especially during the spring when the blossoms are out. Before leaving I met all the members of the household staff, thanked them for the service they have rendered me and assured them that my successor will take care of them. Most of them were in tears. It was inevitable. They had spent ten happy years with me and especially my wife took special care of them. ‘Shaukat Ali, son of Imran Khan, who was a friend of mine, came to see me. I had helped him to go to England to do his bar. He belongs to Dacca and was a close lieutenant of Maulana Bhashani. Now he has given him up and joined the Awami League. Talking about Bhashani, he said the old man is now 84. He had a prostrate gland operation sometime back, the doctors told him that he was good for another 20 years. I said that then God help East Pakistan. I am told that at the time of partition Nehru complained to Sir Sa’adullah of Shillong that Sylhet district was being divided and the major portion being handed over to Pakistan. He will see to its destruction. So there was no cause for worry. Bhashani has been the major disruptive actor in East Pakistan. He is an unprecedented rabble-rouser. I understand that during the recent editors conference held by Yahya a question was asked why action was not taken against me. He replied that he had found nothing against me but if anybody has any evidence he could go to the court. ‘Rashidi came to see me this morning. I particularly wanted to see him to give him a bit of my mind on scurrilous articles he had been writing about me. I reminded him of what I had done for him from time to time. I appointed him as an ambassador over the head of foreign office advice to the contrary. They told me that he was a man devoid of any character and utterly lacking in scruples. He was capable of selling the country and this proved right when we heard from several sources that he had been selling our cipher and committing many other irregularities. Later, when he returned to Pakistan, I saw to his maintenance from different sources. In return what do I get, abuse from him. He was ashamed of his conduct and tried to make lame excuses. He said he had taken the courage to call knowing that I will forgive him and so on. Rashidi told me not to give up the Muslim League. Otherwise the field would be left free for my enemies to take their revenge on me when the assemblies come into being. The answer was to appoint a suitable vice president. He thought that Qayyum would be a liability. Yusuf Haroon, Sardar Bahadur or even Khuhro might do. About the recent declaration of the president on constitutional matters he said he found an undercurrent of resentment in the Punjab on the break up of one unit. They feel that the cause of Pakistan has been damaged and the process of disintegration started. Whilst they had made so many sacrifices in the national interest they also feel that Bengalis and the smaller provinces are out to do Punjab down. This feeling can assume explosive proportions and there is no leader of any stature in the Punjab to hold it in check. There is no hope of the constituent assembly succeeding. Rashidi did not see how agreement could be reached on burning issues like the system of voting, division of powers between the provinces and the centre and the second house. He was sure that there will be a breakdown and then what? Politicians will certainly be discredited. Rashidi said that basically Bhutto is a fascist. He is power hungry and wants to misuse it and victimize people. He did a good deal of that when he was a minister. All this talk of socialism is nonsense. Sindhi Mahaz knows that and will do all in their power to see that he does not get elected from Larkana. He said that Bhutto had no chance in Larkana even if there were more than one seat in the district from the central assembly. I did not agree with that. If Khuhro is untouched in his seat, who else will compete with Bhutto. He said there is a man that is being groomed. Bhutto is asking Ghulam Mustafa Jatoi to vacate his seat for him, which is doubtful. He said the only other way Bhutto can come into power is by becoming a minister by getting around Yahya. Having done that he will turn on Yahya or he will incite young army officers to rise against Yahya. G. M. Syed told all this to Yahya. Yet Yahya sends a personal message to Bhutto when the recent scuffle took place with him in Sadiqabad. This is unheard of. Bhutto is going to make full use of it to build up his image and give credence to believe that the president is in his pocket. He said Bhutto is spending money lavishly. A large number of people are paid upwards of 500 each. Most of the press correspondents are paid. Where is he getting all this money from? Rashidi, along with G. M. Syed and others, went to General Sher Ali [Pataudi], the minister for information. They complained that in spite of the martial law regulations, anti-lslamic and communist propaganda was being made in the press which is full of communist views. They were going to explain more but Sher Ali cut them short by saying that he has already countered 80 per cent of them, 10 per cent more are on the point of conversion and he is working on the rest. Seeing that the man’s mind was shut and he had his own make believe they decided to take leave and came away as it was no use continuing with the talk. Some people are asking the president to make his position clear vis-a-vis the assembly. They expect him to act purely as a constitutional president. In other words, endorse what the assembly says and become ineffective. Asghar Khan has announced today that he has decided to retire from active politics now that his limited mission of removing the corrupt and despotic regime has been achieved and a clear guarantee has been given by the president that elections will be held and democracy restored. He will watch its progress with interest. This announcement may have been caused due to frustration with the politicians who, having used him during the upsurge, are now giving him no place in party hierarchy or it may be a trick to become neutral and be available for an office to any party that comes into power. It may also be due to realization that he has no hope of getting elected from anywhere. I think he has made soundings in many places without much hope of success. He and Bhutto would, of course, have liked to have seen the presidential system stay in which they saw chances of being selected as a candidate by one party or the other.